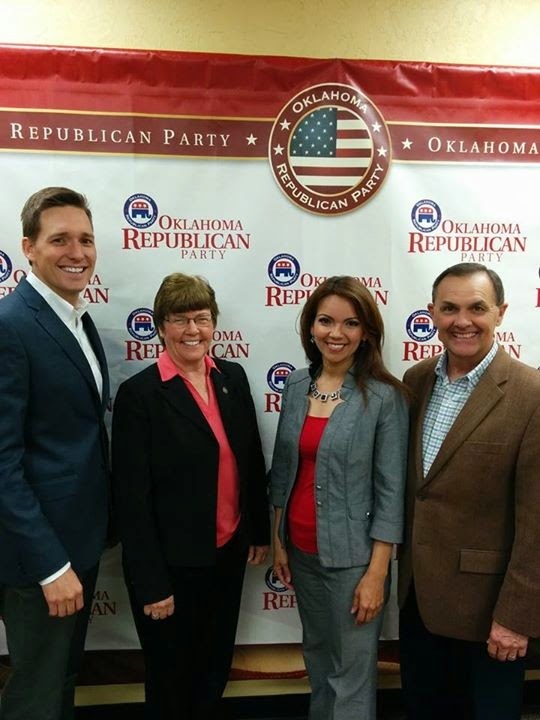 At the Oklahoma Republican State Convention on Saturday, delegates elected Randy Brogdon as the new state chair, and Estela Hernandez as vice-chair. Approximately 1300 delegates were in attendance for the convention, which featured a three-way race for state chair, as well as the vote for a new vice-chair. The convention was hampered by problems with the registration/credentials process. The original plan was for the chair/vice-chair races to be voted on before the lunch break, but due to software problems it was 2pm before the convention gave up on getting an official credentials report, and settled for calling a delegate "credentialed" if they possessed the badge and ballots given to them when they checked-in that morning. Because business was backed up so late, the convention never took a lunch break. On the first ballot for chair, Brogdon received 47.45%, Pollard took 29.11%, and Weston got 23.43%. In the runoff round, Brogdon won with 53.35% to Pollard's 46.65%. In the race for vice-chair, Estela Hernandez defeated John T. Lewis 58.12% to 41.88%. Chairman Weston used a new registration/credentials process this year, and the project was not run by anyone who had been in charge at previous conventions. The staff did their best to make it work, but things just didn't go right. I think that frustration that mounted due to the credentials situation helped contribute to Weston's defeat. Here are two lessons I think can be learned: 1) if you have never run a convention before, don't try to reinvent the process and use an untried system; and 2) if you decide to reinvent the process, don't do it when you are on the ballot -- there is no chair race at the presidential-year convention. Big kudos go to State Auditor Gary Jones, who had the unenviable job of chairing the convention. Jones, a former party chair himself, did an excellent job and has received much praise for his performance. Credentials may have been a fiasco, but Gary kept the convention orderly and cordial. David Van Risseghem has posted a good synopsis of the convention on SoonerPolitics, and Mike McCarville has some other reports on the McCarville Report.